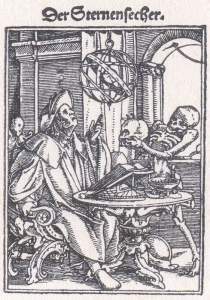 olbein's dance of death was published in several editions from 1538 and later. But the woodcuts are clearly older than this. HAnns Lützelburger / formschnider / genant Franck. As far as we know, the woodcutter Hans Lützelburger died in the year 1526. Melchior Trechsel was one of the two brothers, who published Holbein's dance of death in 1538, and "Hans Formschneider" was probably the same "Hanns Lützelburger formschnider", who cut the woodblocks for Holbein's dance of death (picture to the right). The same year, 1526, Holbein moved to England (although only for a few years to being with). Holbein's dance of death alphabet was used as early as 1524. Froschauer's famous Bible from 1531 copied many of Holbein's woodcuts from the Old Testament, including a copy of the Creation by Holbein. The duchess' bedpost is marked "HL". So the woodcuts had been finished a least 12 years, before the Trechsel brothers published them in 1538. We can only guess as to why it took them 12 years. Were they afraid of censorship? Or did they hope to find a woodcutter, who could execute those woodcuts (e.g. soldier and waggoner) that Hans Lützelburger had left unfinished? At any rate there exist a number of publications, where the woodcuts have been published without any accompanying text, but simply with a headline over each scene. These prints can be recognized by being printed very carefully with black ink, and by the fact that there's no text on the back of the paper. The astrologer, "Der Sternensecher" with black letters, is only known in a single exemplar. They are often referred to as "printer's proofs" or "proof impressions" but this is misleading. A "proof" would mean that a printer had made a single sheet to ensure the quality, or maybe that the woodcutter had secured himself a single sheet to display a sample of his skill. In contrast the great number of these prints that still exist shows that we are dealing with proper publications. Most of these series have headlines with "ordinary" Roman letters, slightly inclined. There are no complete collections with 41 proofs, for all are lacking the astrologer. The explanation is probably simply that 10 images have been printed on each of 4 sheets. There is another series, where the headlines are written with "Gothic" black letters, and here we find a "Sternensecher" (picture to the left). Only one copy is known of this series and six of the scenes are missing, while five are lacking the headline. The following table is from Woltmann. The left column is the complete copy (but without astrologer) from the National Library of France. The right column is the series with the astrologer and Gothic headlines, which also resides in the National Library of France. The sequence is very different from the one found in the later book publications. First come the four scenes from the Old Testament. Then come the clergy (including the physician), then the laity and then the women. The ossuary, which in the books mark the beginning of the dance, instead mark the end and leads onto the final scene with Judgment Day. As always(4) the sequence ends with the Escutcheon of Death. 1. Die schöpffung aller ding. 1. Die Schöpffung aller ding. 2. Adam Eua im Paradiss. 2. Adam Eua im Paradiss. 3. Vsstribung Ade Eue. 3. Vsstribung Ade Eue. 4. Adam bawgt die erden. 4. Adam bawgt die erden. 5. Der Bapst. 5. Der bapst. 6. Der Cardinal. 6. Der Cardinal. 7. Der Bischoff. 7. Der Bischoff. 8. Der Thumherr. 8. Der Thumherr. 9. Der Apt. 9. Der Apt. 11. Der Predicant. 11. Der Predicant. 12. Der Münch. 12. Der Munch. 13. Der Artzet. 13. Der Artzet. 14. Der Keyser. 14. Der Keyser. 15. Der Künig. 15. Der Künig. 16. Der Hertzog. 16. Der Hertzog. 17. Der Richter. 17. Der Richter. 19. Der Groff. 19. Der Groff. 20. Der Ritter. 20. Der Ritter. 21. Der Edelman. 21. Der Edelmann. 23. Der Rychman. 23. Der Sternensecher. 30. Die Küniginn. 30. Die Keyserin. 31. Die Hertzoginn. 31. Die Künigin. 32. Die Greffinn. 32. Die Hertzogin. 33. Die Edelfraw. 33. Die Greffin. 34. Die Aptissinn. 34. Die Edelfraw. 35, Die Nunne. 35. Die Aptissin. 36. Dass Altweyb. 36. Die Nunn. 39. Dass Jüngst gericht. 39. Gebein aller menschen. 40. Die Wapen dess Thotss. 40. Das letzst Urteyl Gottes. Alfred Woltmann, Holbein und seine Zeit, 1868, vol 2, page 407. In the column to the right, the image of the Escutcheon of Death has the headline »Gedenck das end«, "consider the end". Woltmann points out, that this is similar to the Bible quote that would accompany the image in the publications from 1538 and later: »Memorare novissima &c«. This is from the Vulgate-Bible: »In omnibus operibus tuis memorare novissima tua, et in aeternum non peccabis«. In the King James Bible, Ecclesiasticus 7:36 is translated thus, »Whatsoever thou takest in hand, remember the end, and thou shalt never do amiss«. As a sidenote, the quote »Memorare novissima tua« also finishes the boring sermon at the end of Copenhagen's dance of death (but I haven't bothered to translate this sermon). 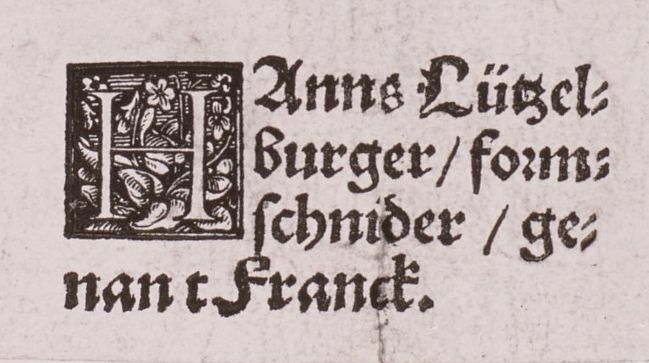 Woltmann uses this to argue that the series with the Gothic headings must be the newer: Partly because »Gedenck das end« prefigures the publication from 1538, and partly because the astrologer has been included. National Gallery of Art. The link goes to the pope, but click Holbein's name. The series isn't complete. British Museum has a complete series that once belonged to William Young Ottley. However this one is not available online. Instead there's another series, where scene #2 (the Expulsion) is missing, and where seven of the prints are lacking the headline. 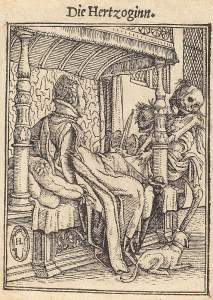 Try to search in their online collection for "Holbein dance of death". The Metropolitan Museum of Art in New York has a collection with 42 images, which has been blended from different series. The headings have been cut off from all the prints except three. The 42 images include all the scenes in the left column of Woltmann's table and also the soldier. In 1538 the woodcuts were published in books with Bible quotes and short verses. Heinrich Vogtherr's copies follow the so-called proofs. Hans Lützelburger . . .: I quote from Holbein und seine Zeit af Alfred Woltmann, 1874, page 194. Unter denen, welche Ansprüche »aus Hansen Formschneiders seligen Gut« haben, ist auch Melchior Trechsel von Lyon mit einem geleisteten Vorschuss von 17 Gulden 15 Schilling eingetragen. Als die Hinterlassenschaft im October 1527 endlich regulirt ist, erscheint Trechsel nicht mehr unter den Gläubigern die abzufinden sind, da er ja durch die ausgelieferten Formen Deckung erhalten. That the drawings were at any rate completed before Holbein left Basle in the autumn of 1526, appears from a circumstance until now wholly unnoticed. The rich collection of the Dance of Death in the cabinet of engravings in the Berlin Museum, contains copies of twenty-three sheets of the woodcut series, in Indian-ink etchings on brown-coloured paper, of a circular form, about five inches in diameter. The copies are true, although enlarged, and are only so far different as resulted from the change of form. Coarse, but executed with understanding, they seem to be sketches for small glass paintings. 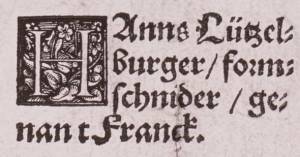 They are made after originals, which appear in the first proof impressions, and it is also to be perceived that they are not executed after drawings but after the woodcuts themselves; otherwise they would be taken from the contrary side, and would scarcely bear Hans Lützelburger'a monogram on the sheet of the Duchess. On the fourth sheet, that of the Emperor, the date, 1527, stands over the throne. The alert reader will notice that Woltmann's two arguments are exactly the same that he used to prove that Ruben's drawings were not the original drawings by Holbein. In Literatur der Todtentänze, 1840, page 9, Massmann brings a list of the series in Berlin. According to him the sequence is very odd and the series starts with the Escutcheon of Death. After several weeks of headache and conflicting sources, I have come to the conclusion that it's best to ignore Massmann.